A small girl, a stutterer, mistreated by family and schoolmates, is invited to attend a boarding school for those like her. Sybil Joines, the headmistress, believes that stuttering, when properly channeled, is a highly evolved method of communication with the dead. Necrophysics, the study of the relationship between this world and the next, is Joines's raison d'etre. But the periodic disappearances of boarders, and alarming events that occur, cause an existential threat to the school that she cannot tolerate. The history of the school is told from multiple points of view that bear witness to the grotesque curriculum. This is a fully realized world, dark and challenging, with three-dimensional characters and accompanying illuminations and artifacts so realistic that you soon forget this is fiction. 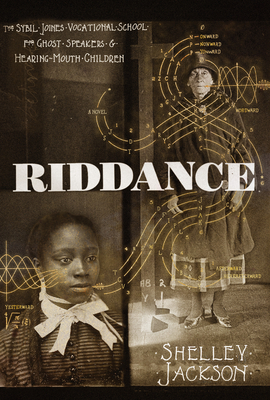 Riddance is an astounding feat of imagination.